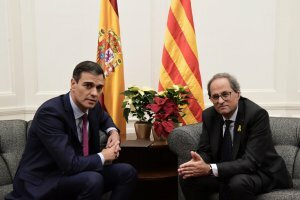 Accusing him of ‘high treason’, Spain’s right-wing and far-right parties have said they will protest together for the first time against Prime Minister Pedro Sánchez over his negotiations with Catalan pro-independence parties. Centre-right Ciudadanos (Cs), the right wing People’s Party (PP) and far-right Vox, which has only recently burst onto Spain’s political scene, all called on their supporters to gather at the central Plaza Colon in Madrid on Sunday morning. This is the first time that Spain’s right-wing opposition mobilises against Sánchez, who has been in power for just eight months. The protest will take place just two days before the high-profile trial of Catalan independence leaders opens in Madrid under the national and foreign spotlight. The right and far-right are furious at the socialist government’s decision to accept the presence – as asked by Catalan separatists – of an independent ‘rapporteur’ in future talks between Catalan parties. These talks will take place in parallel with negotiations going on between the central and Catalan governments as Sánchez tries to ease a secession crisis that came to a head in October 2017 when separatists made a short-lived declaration of independence. Spain’s right wing parties say the decision by the socialist government to accept a demand by Catalan pro-independence parties is yet another example of how it is yielding to their ‘blackmail’. Sánchez, who came to power in June after ousting his conservative predecessor Mariano Rajoy from power, has a very small majority in parliament and needs the support of Catalan lawmakers to pass the 2019 budget. PP leader Pablo Casado labelled Sánchez an ‘illegitimate prime minister’, the ‘biggest felon in Spain’s democratic history’ and accused him of ‘high treason’. Albert Rivera, leader of Ciudadanos (Cs), said Sánchez was ‘showing that he has no scruples and is capable of the worst: to cut up Spain’. Deputy Prime Minister Carmen Calvo, meanwhile, accused them of ‘using the complex situation in Catalonia for partisan purposes’.